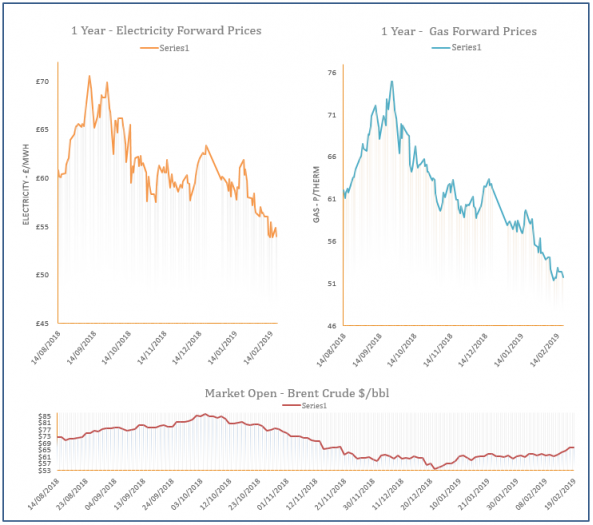 Near-curve gas prices dipped yesterday thanks to an oversupplied system and a warm weather outlook; additional LNG cargoes are also expected to dock in the UK. Meanwhile, coal and carbon markets moved down and oil stabilised, weighing on the far-curve. Gas prices were on the rise during Wednesday’s session as short sellers looked to leave their positions, causing a technical increase on gas markets. Oil, coal and carbon markets also moved higher, providing additional support. Gas prices were little changed during Tuesday’s session despite some support provided by a rise in coal and carbon. However, overall markets were stable and a healthy supply/ demand outlook for this week weighed on the near-curve. Gas prices moved down yesterday with direction coming from bearish European markets. A milder weather outlook also continued to weigh on the near-curve, with a flurry on LNG deliveries also a factor. Gas prices increased on Friday, tracking the movement of coal, oil, power and carbon markets. However, overall fundamentals were bearish with healthy supply, comfortable storage levels and a mild weather outlook limiting gains at the front of the curve.